The European Parliament and European Council have finalised the proposed European Union Copyright Directive with the controversial Articles 11 and 13 intact. Collaborative coding platform GitHub warned last year that a proposed change to copyright rules in the European Union could lead to problems for developers who upload their source to remote servers and onerous conditions on those who host such platforms. Articles 11 and 13 which introduce so-called ‘link tax’ and ‘upload filters’ requirements with the potential to have a serious effect on everything from search engines to Wikipedia. According to Unbounce’s 2019 Page Speed Report, 57% of marketers say they have no plans to implement AMP in the near future, while 23% are still considering it. Google’s past behaviour has made some people wary of AMP. When it comes to waiting for pages to load, most consumers think they’re more patient than they actually are. Nearly 70% of consumers admit that page speed impacts their willingness to buy from an online retailer. LinkedIn has announced a number of new updates to its Sales Navigator lead prospecting tool. After completely overhauling the platform last year, LinkedIn is making it possible for users to share the Custom Lists they create between team members. The company has also added a new search exclusion filter option and more Sales Navigator Application Platform (SNAP) partners. Sharing Custom Lists. At the end of last year, LinkedIn Sales Navigator made it possible for the sales reps using the platform to create lead and account list to help track prospective and existing customers. Now, users will be able to share those lists among team members, making the platform more collaborative. Search exclusions. Users will now be able to perform searches using an exclusion filters: seven attributes that can be excluded from Advanced Lead Searches: company, geography, seniority level, title, function, industry or school. For Advanced Account searches, users can exclude geography or industry. LinkedIn has also expanded the “technologies used” filter available with advanced “account” searches on the platform, a feature sales reps can employ to find companies that using platforms like marketing automation technology, cloud services or a CRM. LinkedIn has also introduced a range of 30-to-40-second how-to videos, designed to help users make the most of Sales Navigator features. Google appears to be testing the delivery of ads in Google Assistant results. The screen below, from Gennaro Cuofano, who performed a search on an Android phone, shows an ad for an Executive MBA program in Italy. He added, on Twitter, that organic results were below the fold and “the answer on the voice assistant pretty much mirrored the search result page on that one”. Google Assistant, which is now on a billion devices, also now has an ‘interpreter mode‘, a new feature called interpreter mode that translates your conversations in real time. The number of voice assistants in use will jump threefold to 8 billion by 2023 from 2.5 billion at the end of last year. Voice commerce will grow to more than $80billion a year by 2023, but mostly will consist of money transfers and digital media like on-demand movies, music and TV shows, rather than physical goods. Even though Amazon is the market leader in smart speakers, the eCommerce giant sees a fraction of sales from its Alexa virtual assistant, only about 2% of Alexa users have ever used an Echo smart speaker for shopping. Google has warned that the Australian competition watchdog’s proposal for a regulator to oversee its algorithm could open the door to spammers. The Australian Competition and Consumer Commission is calling for tough new regulation of tech giants such as Google and Facebook was needed to protect the future of independent journalism. Google’s John Mueller has advised site owners that when content is syndicated elsewhere, it may outrank the original source – despite the presence of a canonical tag. While a canonical tag is a good way to indicate which is the original piece of content, it might not always be “correct,” in the sense that the pages are completely different in the eyes of Google. For example, a block of text might be the same across both pages, but other content surrounding the text could be providing additional value. Click share – the estimated share of all achievable clicks that you have received- has been available for Shopping campaigns since 2015. Now Google has begun rolling it out for Search campaigns and plans to have it available for all Search campaigns in the coming weeks. The lower your click share, the more opportunity you have to capture additional clicks. For example, if your ad is clicked 20 times, but we estimate that it could have been clicked 100 times if you had more extensions, higher bids, or higher budgets, your click share is 20%. 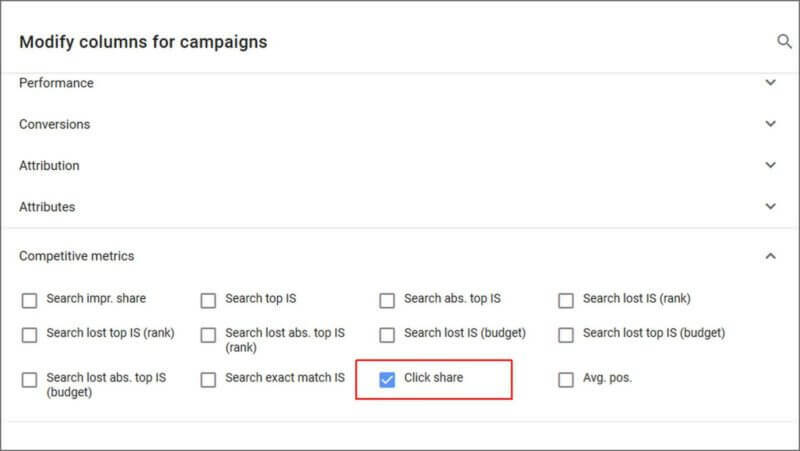 Click share will be available at the campaign, ad group, and keyword levels for Search campaigns in the coming weeks. On a recent Reddit discussion, Google’s Gary Illyes said that “Country the site is local to, RankBrain, PageRank/links, language, pornyness, etc”. This was in response to a question asking for elaboration on the three ranking factors (relevance, freshness and popularity).